RIO DE JANEIRO, Jun 18 2012 (IPS) - The BRICS countries (Brazil, Russia, India, China and South Africa) face a key choice: to opt for “good” development aid, based on sustainable development, or for the “bad” old traditional model, which they criticised when they were its recipients. This was the conclusion of a debate on the sustainability challenges facing the leading emerging economies in BRICS, at the People’s Summit being held in parallel to the United Nations Conference on Sustainable Development, or Rio+20. While countries like Brazil have not ceased to receive international aid, the size of their economies has turned them into global aid donors, said Adriano Campolina, country director for ActionAid Brazil. 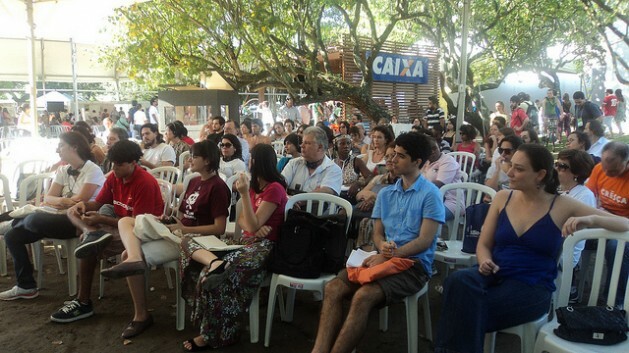 While the government promotes family farming to combat poverty and inequality and improve food security, at the same time agribusiness is expanding in Brazil, with the growth of monoculture and the concentration of land tenure in a few hands, creating unemployment and harming the environment, Campolina told TerraViva. “These contradictions wind up being reproduced in the development aid strategy,” he said. On the one hand, the government promotes “good” cooperation with African countries, emphasising family agriculture and food self-sufficiency, for instance. But on the other hand, it also practises “bad” aid policies, selling its own technology for producing ethanol from sugarcane and acquiring vast tracts of land in other countries for monoculture plantations of soybeans or sugarcane, replicating its national agribusiness model, he said. Olga Ponizova of the Centre for Environment and Sustainable Development (Eco-Accord), a Russian NGO, described a similar strategy in her country, which subsidises the construction of nuclear power plants abroad by Russian companies. “The challenge, as we grow richer, is for our aid not to repeat the imperialist strategy of development aid of the past,” said Vera Masagão of the Brazilian Association of NGOs (ABONG). It is possible to implement “good” cooperation, based on solidarity, by exporting successful experiences that have arisen from years of social progress, she said. The most serious problem, according to Sergio Schlesinger, is a different kind of development aid that does not appear in the official accounts, but is greater in terms of invested resources. This is the participation of Brazil’s private sector in international cooperation, through subsidies granted by state institutions like the Brazilian Development Bank (BNDES), said Schlesinger, of the Federation of Agencies for Social and Educational Assistance (FASE). The subsidised assistance for projects in aid-receiving countries ultimately benefits Brazilian oil, mining, infrastructure and agribusiness corporations, he said. Schlesinger described the Brazilian strategy of “multiplying the number of countries producing ethanol” in Africa, Asia and the rest of Latin America, rather than monopolising the global market. “Brazil realised that its aim of being a major world supplier of biofuels would not be met if it remained the only producer, so it began to encourage other countries, mainly in Africa, to invest in ethanol production,” he told TerraViva. This kind of assistance is muddied by self-interest, he said. ABONG’s Masagão fears that “the banned practices for which countries of the global North were criticised, like making aid conditional on purchasing products or technology from the donor country,” may be replicated. Adhemar Mineiro, who studies the BRICS economies, pointed to the social and environmental consequences of this scheme. “As Brazil’s companies have become globalised, the country has turned into a major supplier of minerals, energy and commodity foods,” said the economist. In Brazil, such exploitation is criticised as “unsustainable,” but this country itself practices it abroad, he said. Marcia Andrews, a South African activist with People’s Dialogue, an organisation building political and intercultural dialogue between Southern Africa and Latin America, said there should be more monitoring to examine and avoid “bad” cooperation mechanisms, as have been described for Brazil and China. None of the BRICS has a clean sustainable development record, she said. Andrews expressed concern over the inclusion of her country in BRICS, a move that she attributed to pressure from China, which views South Africa as a “gateway” to the African continent for Chinese trade and investment. But making these contradictions manifest is not a simple matter in countries like South Africa or Brazil, that are governed by left-wing parties that which waged long struggles for freedom and democracy. How can you build a viable opposition against governments that call themselves progressive? asked Andrews, expressing a concern shared by many at the People’s Summit.